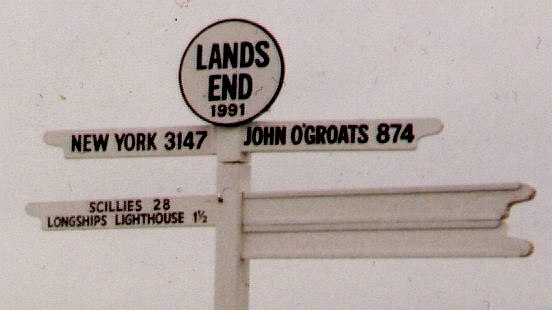 Land's End to John o' Groats is the traversal of the whole length of the island of Great Britain between two extremities; in the southwest and northeast. The distance by road is 874 miles (1,407 km) and takes most cyclists ten to fourteen days; the record for running the route is nine days. Off-road walkers typically walk 1,200 miles (1,900 km) and take two or three months for the expedition. Two much-photographed signposts indicate the distance at each end.